Transportation is Florida’s #1 source of carbon emissions and air pollution. We now have a golden opportunity to change that. How should we invest Florida’s $166 million of Volkswagen funds in our state’s transportation future? 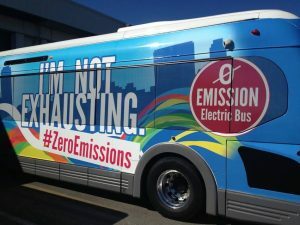 Tell the Florida Department of Environmental Protection (FDEP) to resist dirty, obsolete fuels and so-called “clean diesel” buses, and invest instead in clean, zero emission electric transit and school buses, and a rapid charging EV network for our highways. This one time bonanza of transportation investment funds from the VW diesel scandal settlement can either be invested wisely in clean, quiet zero emission electric transportation, or it can be used to buy more dirty, noisy diesel, propane and fracked (not “natural”) gas vehicles. Before making a decision, FDEP wants to hear from you. Together, we can send a loud message: — Florida must switch from dirty fuels and invest in 100% clean zero emission electric transportation that fights climate change as it cleans up our air. Tuesday, March 27, 2018 3:00 p.m. – 5:00 p.m.
Wednesday, March 21, 2018 3:00 p.m. – 5:00 p.m.
Thursday, March 22, 2018 3:00 p.m. – 5:00 p.m.
Wednesday, March 28, 2018 3:00 p.m. – 5:00 p.m.
Thursday, March 29, 2018 3:00 p.m. – 5:00 p.m.